Traditional Square Single-Door Deadbolt Entryway Set (Oil Rubbed Bronze Finish) - This entryway set is made from solid brass and measures 3 inch wide by 10 1/8 inch tall. Shown with the round brass knob. Other styles of knobs available at no additional charge. Entryway set deadbolt to knob center-to-center distance is 5 1/2 inches - other center-to-center distances are available upon request. 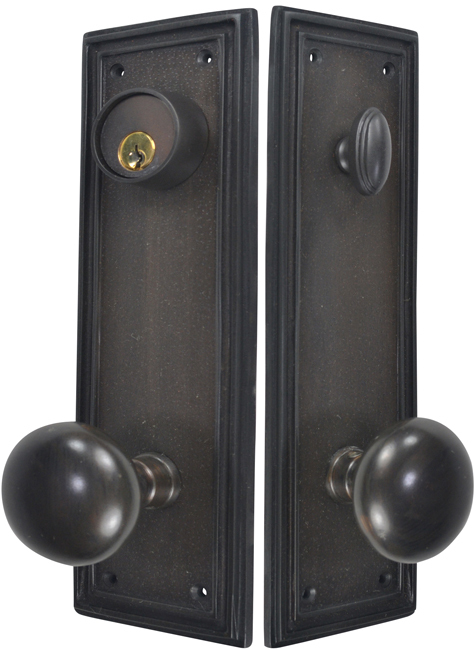 Entryway backset comes as 2 3/8 inch standard and a 2 3/4 inch backset is available at no additional charge. This is a complete set and it comes with tubular latch mechanisms, strike plates, complete knob sets, internal mechanisms, deadbolts and all mounting hardware.